We finally met up with Harshnag at Morgur’s Mound only to be attacked by our powerful new enemies. PROGRAMMING NOTE: Due to DM’s holiday office party, next week’s session will need to be rescheduled. Stay tuned to my blog for the announcement. The massive frost giant emerged from behind the hill. 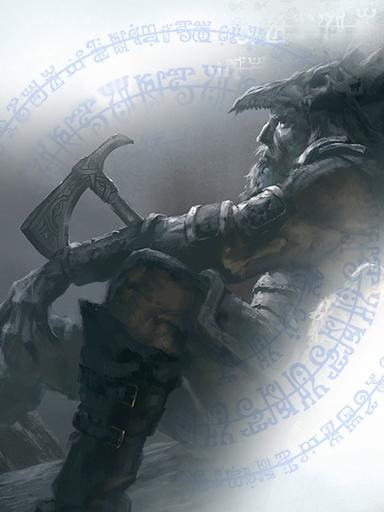 Even for a frost giant he was battle-worn and grizzled, proudly wearing the skull of a dragon upon his head, and wielding a greataxe with glowing runes. I looked at Halfred, whose face broke out into a wide grin. He practically waved back. Harshnag mentioned the name of Halfred’s friend and mentor, which lit up the halfling’s face even more. Harshnag had been put on the same path as us, hunting the Ostorian relics. He also knew why that was important, but before he could explain, his eyes turned sharp and he gripped his axe, motioning behind us. The creatures resembled walking boulders with arms. They approached slowly, and I could see each hefting a large warhmmer. My heart sank as I saw their leader. He looked exactly like T.I.M., but adorned in blood red robes. After an exciting side quest involving a big dragon-filled battle we return this week to hunting ancient Giant relics. We finally meet up with Harshnag at Morgur’s Mound but it’s anything but a peaceful reunion for he and Halfred. The journey from Ascore to Everlund was uneventful. We stabled our poor overworked hippogriffs and hopped on the Harper Teleporation Circles. We arrived in Mirabar, the closest city to our next destination: Morgur’s Mound. For a pittance (we are ridiculously flush with cash after nabbing two dragon hoards) we wre able to purchase a ride on a caravan to Xantharl’s Keep, the town that was none too pleased with us ridding them of their Zhentarim presence. More coinage and bribes let us sleep for the evening unmolested, and we set out for a short two-day walk into the Crags, toward Morgur’s Mound. Poor Harshnag had been waiting a solid week by the time we arrived at the ancient frost giant burial site, which appeared to be the fallen remains of an impossibly large dragon. 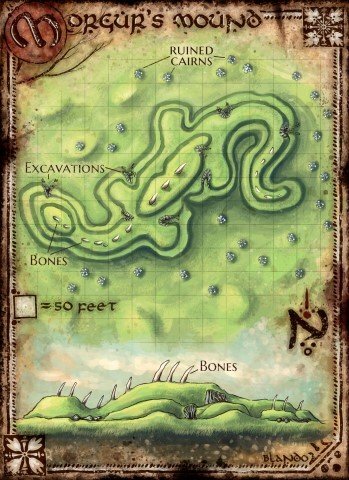 The site was popular for treasure seekers, and numerous excavation openings dotted the area, plumbing into its depths beneath the ground. We found semi-fresh tracks leading into one particular site, but Halfred sensed Harshnag on the other side of the Mound. He and I went to catch up with him while the other three stayed back to look for any trouble. Trouble would soon find us, though we did find Harshnag first. The gruff but friendly frost giant was amiable at seeing his old friend and ally, Halfred. Harshnag was on a similar mission of relic-hunting in order to gain an audience with the All-Father, Annam, ancient god of the giants. Apparently the Temple of the All-Father is where the Ordning was first created, and where we could find answers to the chaos currently gripping all the giants and dragons. Harshnag informed us that it would require six rune-based relics to gain entrance. He proudly wielded one of the them, a massive greataxe inscribed with runes, while we had our two from the Grandfather Tree and Berounn’s Well. One lay nearby here in the mound. Before we could investigate it, Harshnag noted a small army of rock creatures approaching our position. Half a dozen creatures wielding warhammers approached in a military formation, fanning out on our position. Their leader looked exactly like T.I.M., only wearing robes instead of armor. The lead construct spoke with a monotone expression, devoid of all feeling or empathy. Its demands were simple: capture “the one like me” and “the traitor,” and kill the rest of us. We tried to briefly parley while the rock constructs methodically advanced on us. The thinking construct knew of T.I.M., and knew that T.I.M. needed to be purged of his soul to properly rejoin the ranks of the mistress – the ancient blue dragon who had slain Zephyros, taunted us in the caves after Ascore, and presumably started this whole mess. As we had learned from her visit in the caves, she has a personal hatred for Korinn, though interesting that she wants her captured instead of slain. I tried to deceive them into following a wild goose chase down into Morgur’s Mound, but at that point the rest of our party saddled up behind them, and weren’t exactly stealthy about it. The constructs attacked, seeking to knock out T.I.M. and Korinn and slay the rest of us. But we had a Harshnag. Due to our party split we had them surrounded, so they were forced to split up to attack us. Unfortunately the talking construct was a spellcaster, and he fired off several nasty spells at Halfred, Kazin, and Harshnag, including Ice Storm and a Fireball. Harshnag would take the brunt of the damage but he stood his ground like a champ, as well as shrugging off blow after blow from a pair of warhammers. Halfred would focus all fire on the mage construct while I helped Harshnag with the two, then three, then four attacking us on the left. T.I.M. engaged the two who went right, summoning leeches and using his Sticky Shield and Flame Scarf defensively. Bryseis cast a nasty, jumping Chaos Bolt. With Tides of Chaos and crazy high damage she was forced to roll on her Wild Magic Surge table, and recieved her fourth bad wild magic roll in a row – Confusion centered on herself. T.I.M. made the save but both she and Korinn would be affected by it for several rounds, knocking them out of the early fight. Korinn finally shrugged off its effects and used a Lightning Bolt to decimate the pair on the right. Halfred sunk several well-placed arrows into their mage leader, downing him but keeping him alive. 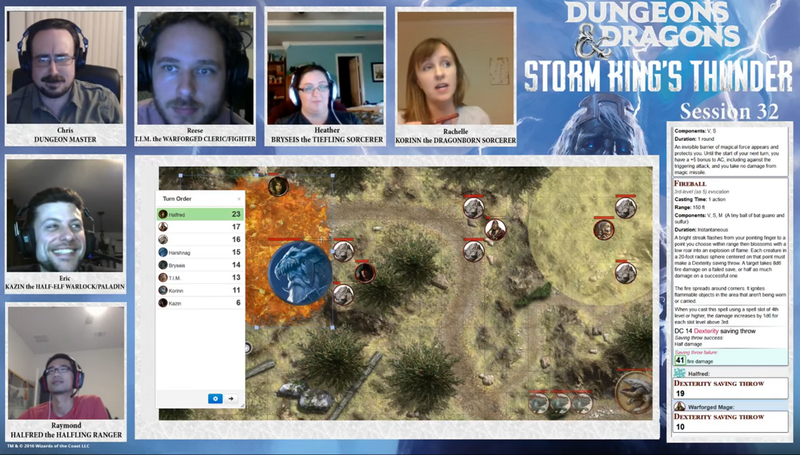 Harshnag and I (and Halfred) were taking some brutal hits from the rock constructs, forcing me to use Armor of Agathys to help mitigate the damage before the rest of the party could join us and quell them. We bound and gagged the mage construct, hoping to learn what we can about our powerful enemies, and in particular where T.I.M. fits in all of this. 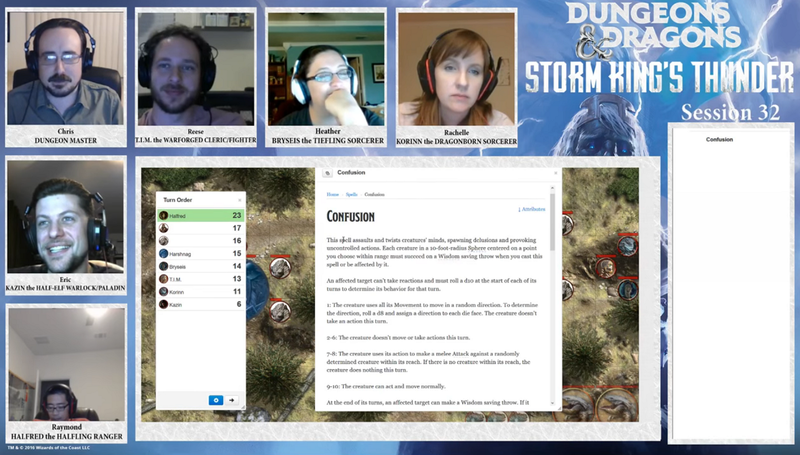 I’m really impressed with how the DM is incorporating some of our backstories into the main plot! For now we Short Rested and head into Morgur’s Mound to recover the fourth relic.